In simplest terms, multi-channel marketing is using many different marketing channels to reach a customer – traditional media (such as newspapers, TV, radio, outdoor), your web site, online advertising, email blasts, e-newsletters, video, direct mail catalog or mailers, word-of-mouth personal communications, mobile advertising and text messaging, even the in-store experience should be considered a marketing channel. Customers today are hyper-connected and more empowered than ever. They want advantages like instant and constant access, broad selection, and dynamically delivered information. They also want the advantages of physical assets, such as personal service, the ability to touch products, and a personal shopping ‘experience’. Essentially, customers now expect to be served wherever they want, whenever they want it; and through whatever channel they want. The objective is to make it easy for a consumer to buy products and services in whatever way are most appropriate for that person at the time they want to buy. For retailers, in addition to offering the customer more options, multi-channel marketing allows a business more opportunities to interact with customers - each channel can help to promote the other channels and build a relationship with your customers. Marketing has always been multi-channel – it’s just that we didn’t have so many options to use, integrate, and manage as we do today. Satisfying demand can be a Catch 22 for marketers today. They are being asked to reach more customers and deliver better results, often with limited or no increase in budgets; while customer expectations continue to escalate and channels proliferate. All of which requires today’s marketers to communicate and interact in more ways than ever before. While each channel works differently, marketers must find ways to integrate channels to achieve maximum results. For example, instead of pouring all of your resources into one communication vehicle, you might include a color ad in a newspaper, promote the same sales or feature on your website, then roll out a direct mail campaign or email with a coupon and post the promotion on Facebook or Twitter the day of the sale. The purpose of this paper is to help retailers better understand the challenges, identify the opportunities that they can legitimately capitalize on, and avoid some of the pitfalls that can turn a great idea into mediocre results. In short, to help you understand how to use the concept of multi-channel marketing to grow your business. The customer purchase funnel is a model which describes the theoretical journey a customer makes from their first contact with your brand to purchase. The idea of a funnel was first developed in the 19th century, and is still taught in marketing schools today. This model is important because it provides a method of understanding and tracking the behavior of an average customer throughout the sales process. The shape, number of stages and duration of the process can vary depending on both the consumer and the nature of the product, as well as many other factors. Many different versions have been published, but the fundamental stages remain the same. 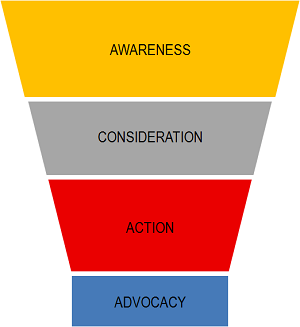 A funnel shape visually conveys the natural reduction in potential customers at each stage - many people may be aware of a particular brand, but this does not mean they will all consider and ultimately purchase the product. Different channels can be used depending on the stage at which the customer is located within the funnel. For example, traditional media, like display advertising and broadcast media, digital tools like your website, social media, and mobile display advertising may be the options you choose to create brand AWARENESS and communicate your value proposition. During the CONSIDERATION phase, many channels can impact potential customers at a time when they are “doing their homework” on your brand. This is where targeted display advertising, your website, and other digital tools like landing pages for desktop and mobile devices, search engine marketing and optimization (SEM/SEO), pay-per-click online advertising and customer reviews play a role in differentiating your product or service from competitors. Ultimately, you want to move them to ACTION and ADVOCACY, Promotional channels like display advertising, direct mail, sales flyers, email, and mobile can deliver a strong call to action. Reviews and referrals through social media channels can then build loyalty and retain customers. Why is multichannel marketing important? Multichannel marketing is important for the simple reason that you must be where your customers are at the time they are in the mood to consider or buy. There’s no doubt that customers today have much more control over the buying process than marketers do. Thanks to the proliferation of available channels, customers have more choices than ever when it comes to how they want to get information. Today there are more ways to reach customers – both in terms of number and variety of channels – than we could have imagined not so long ago. And as the number of channels continues to rise – and it most certainly will – the need to embrace multi-channel marketing will become an essential component of any successful marketing program. The variety and availability of multiple marketing channels means that potential customers could be anywhere at the time they want to research alternatives or to buy. Marketers need to be where they are when they want to buy, not when you want to sell to them. As the number of potential marketing channels grows even more, designing multi-channel marketing campaigns will continue to be a key for reaching and converting prospects to customers. Studies have reported that 72% of consumers prefer an integrated marketing approach, yet some businesses are still not using a multi-channel program for their marketing. How can retailers use multi-channel to grow their business? It starts with gathering and processing information about your customers. Gather as much information as you can about your customers – who they are, how and when they shop, how they learned about your store, what are their media consumption habits, etc. Collect contact points (email addresses, physical addresses, and phone numbers) for your customers using sweepstakes, prizes, giveaways, or customer satisfaction surveys. Having a lot of customer data is not the same as having a good view of the customer’s needs and how to reach them. It’s not just the data itself that is important; it’s what you do with the data that’s important. And remember that your customer view must evolve to stay current. Customers change just like business and marketing channels change. Your customer view must change along with them. That means bringing in new data, refreshing old data, building new models, updating old ones, etc. Keep your communications and brands messages consistent across all channels. Remember that your customers experience your brand as a whole, whether their interactions or brand touchpoints are in-store, through print advertising, online, over the phone, or some combination of these. What value is there in communicating your value proposition online if a customer’s in-store experience doesn’t match the expectations you create? If you treat each channel as a distinct entity, you run the risk of turning customers against you if you fail to deliver consistency. Provide promotional tools (coupons, bag stuffers, etc,) via multiple channels to maximize awareness and encourage store customers to visit/re-visit your store or website. Post special deals and sales information in multiple channels for maximum reach. Measure your success. One of the most important steps to multi-channel marketing is to evaluate your marketing efforts for its return on investment (ROI) in order to determine the best use of your marketing dollars going forward. Businesses that embrace this change to multi-channel marketing will reap the benefits of better consumer awareness and differentiation, reduced customer acquisition costs, lower servicing costs, and higher customer and employee satisfaction. Welcome to the era of multi-channel marketing.